When the last 20 years of Mr. Ure’s solo acoustic US tours are taken into consideration, they weren’t what I was looking for from him, so I didn’t go. I can’t say what sparked the idea of him playing electronic rock music again, but I was ready to give him the benefit of the doubt due to the electric power that the show would consume. I suspect that the end of Ultravox [if you believe Billy Currie’s pronouncements, now seemingly scrubbed from the web] may have prompted Ure to consider a North American tour leaning heavily on Ultravox [throw me in the briar patch] all by his lonesome, since US fans missed out on the return of Ultravox phenomenon. History has proven that Ure has the gumption to tour solo in America in the face of almost no commercial interest, historically. Traditionally, by touring as simply as possible. This tour actually had a band, as basic as it was. Of course, this couldn’t be an Ultravox tour; the rest of the band weren’t there. To that end he took a minimal “power trio” approach to the material. I was fine with that. Truth be told, I found the stark rock minimalism of much of it kind of interesting, since I had all of the live CDs Ultravox had released in the new millennium. They were pretty great. I liked them better than earlier live recordings that the band had released. Most of the tunes in concert relied more heavily on Ure’s electric guitar, and again, I point to my indifference to his many, many acoustic tours of North America, and say that this was just fine with me! The approach had the added benefit of making some of his solo material sound better than it ever had to my ears. My friend [and commenter] JT is a music professional, and he, like Shelf, found the performance of the band to be less than he desired and was ultimately phlegmatic about the show he saw. I suspect that he views music performance through a lens of his profession; just as I pass judgement on any graphic design work that I see in the public sphere. I knew I was not getting Warren Cann and Billy Currie going into this, and was feeling pretty generous to Ure in spite of years of being miserly towards him. When I took assessment of myself regarding Ure of late, I felt that such a hard, inflexible line was not doing me any favors. 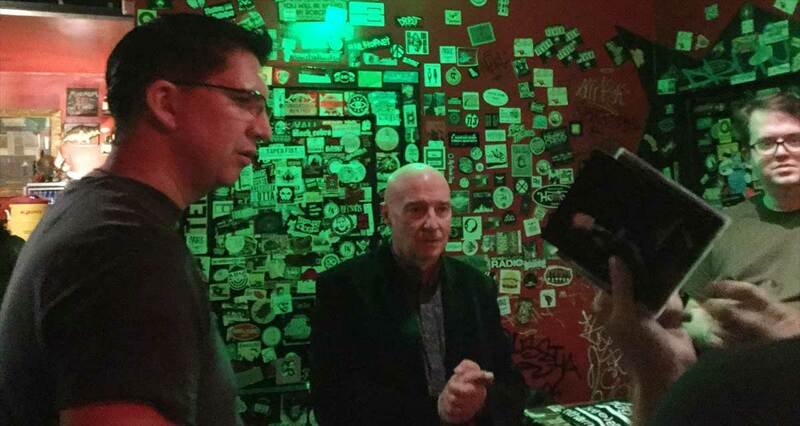 When I asked Midge Ure if he could request a no-smoking show from the very smoke-filled venue and he took care of it, well, now Midge Ure was the one doing me favors. Literally! Was I thrilled to hear “Beneath A Spielberg Sky?” Not really, but that was a minor blip in what was for me an engaging show by an artist I really, really liked back in the most exciting period of music I had ever heard in my life, playing the tunes that I was most interested in hearing from him. That he was putting the ones I didn’t necessarily want to hear in the best possible light was icing on the cake. I have never heard him perform “If I Was” or “Become” and had them sound this good before. As for the issue of show length, I was paying attention and the show clocked in at a tight 85-90 minutes. I have opinions on show length and the first chapter in my book on this business called “show” is a single page that says “always leave ’em wanting more.” I can’t tell you how many concerts I’ve seen where the plot gets lost as the band plow their furrow perhaps a bit more sloppily and deeply than it needed to go. There have been local acts that I honestly thought were great bands, like Central Florida’s Bughead. In spite of the dozen or so times I saw them play, I never managed to see a full show; they just kept pulling song after song out of their endless sets. After 3 hours, you would think they might like to go home; I eventually had to. So I have to side with commenter Jordan on the issue of overplaying. I think it happens and is best avoided; unless you are David Bowie. Since I paid $20 advance for the Ure concert, in a small club, I had no qualms about the length of the set. For the material I was finally hearing, and enjoying, I would have been fine with $50. This entry was posted in Core Collection, Scots Rock, Uncategorized and tagged 2016, 2017, Live Concerts, Midge Ure, Ultravox. Bookmark the permalink. I still go to between 25 – 30 gigs a year. Many times I go alone as when you reach a certain age the number of people with the time or interest is limited and my wife is not a lover of any venue without seats….occasionally after a day at work it can be an effort to leave the house, but I soon remind myself of how lucky I am to have the opportunity to see the kind of bands that thankfully come within reasonable distance of my town. The impact of any given gig is dependent on many factors, sometimes you see an artist at the perfect time, maybe when they have maximum resonance in your life, if they then also at least come close to meeting expectations then a great night is guaranteed. Iggy Pop at the Royal Akbert Hall this year, falls into that category. After gig going for over 34 years, that I could see one of the best gigs I can recall, makes me very happy. Other times the best gig can be the one where you have minimum or no expectations, I saw a band called Desperate Journalist supporting Chameleons Vox earlier this year and they turned out to be the best new band I’d seen in a long time. This probably means I’ll go on attending gigs until I drop…. As to length of gig, 80-90 mins is what I expect, but in the end quality over quantity is what’s important. Re Midge, anyone who gigs at the level he is, is doing it for the love of music and that impresses me hugely.